Whetu Tirikātene-Sullivan (Ngāi Tahu, Ngāti Kahungunu) became the first female Māori Cabinet minister when she was sworn in as Minister of Tourism in Norman Kirk’s third Labour government. She was also Associate Minister of Social Welfare until September 1974. For more than a year, she held both the tourism and environment portfolios. Seeing tourism as a means to earn overseas funds to finance social welfare programmes, Tirikātene-Sullivan moved to modernise the Tourist Hotel Corporation, which ran loss-making hotels in remote scenic locations. As Minister for the Environment she oversaw the bedding-in of a system of environmental impact reports on major projects. The only woman in the Kirk and Rowling cabinets, she played a key role in preparations for International Women’s Year and led the New Zealand delegation at the tumultuous United Nations conference that marked this milestone in Mexico in June 1975. A lifelong activist for Māori rights, Tirikātene-Sullivan championed the teaching of te reo Māori and pressed for the remit of the Waitangi Tribunal established in 1975 to be extended to claims dating back to 1840. This provision was eventually implemented by David Lange’s Labour government in 1985. Whetu Tirikātene-Sullivan was also a strong advocate for Māori art and design. As a fashionable young woman she supported Māori designers by wearing contemporary Māori fashion that blended modern design with traditional Māori motifs. She was involved in the Māori Artists and Writers Association from its establishment in 1973. 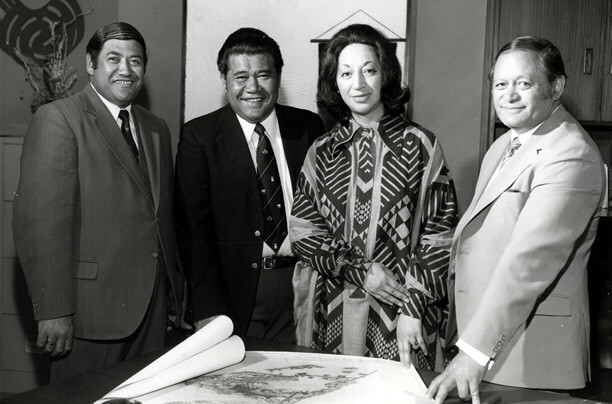 Tirikātene-Sullivan was the then-youngest woman MP ever when she succeeded her late father Sir Eruera Tirikātene as Member for Southern Maori in 1967. The first MP to have a baby while Parliament was in session, she later became the first Cabinet minister to give birth. In both cases she was back at Parliament within a few weeks. Whetu Marama Tirikātene-Sullivan was named by the prophet W.T. Rātana and raised at Rātana Pā, New Zealand’s largest Māori community. She had a distinguished public service and academic career before entering politics somewhat reluctantly. By the time she was defeated in the 1996 general election she was New Zealand’s longest-serving female MP. She was appointed a Member of the Order of New Zealand – the country’s highest honour – in 1993 and died in 2011. We have 40 biographies, 7 articles, related to First Māori woman Cabinet minister.